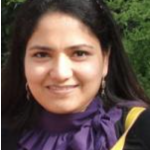 Nidhi Rawat conducts research and teaches at the University of Maryland, using her PhD in Plant Biotechnology, received from the Department of Biotechnology at the Indian Institute of Technology, Roorkee, India. Her current research involves studying the evolving challenges that plant pathogens pose to the production and quality of crops. She has been investigating how plants interact with pathogens and developing solutions to fungal diseases of small grain crops. Her long term goal would be to apply her findings to solving diseases in other crops caused by Fusarium spp.